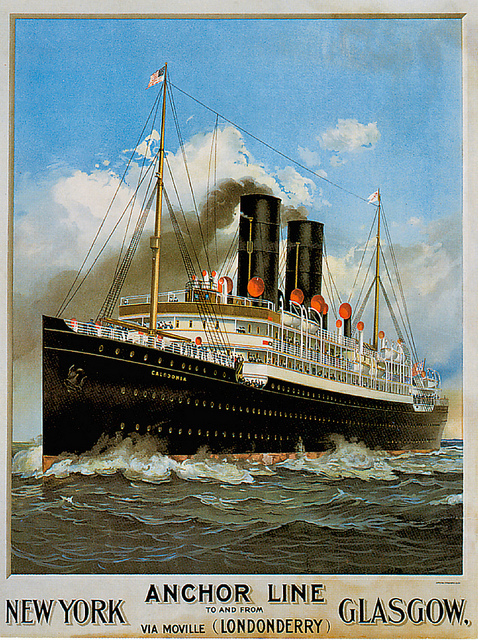 Figure 1: Poster showing the British passenger liner S.S. Caledonia, built in 1904 for the Anchor Line and used primarily for trips between Glasgow, Scotland, and New York City. Click on photograph for larger image. 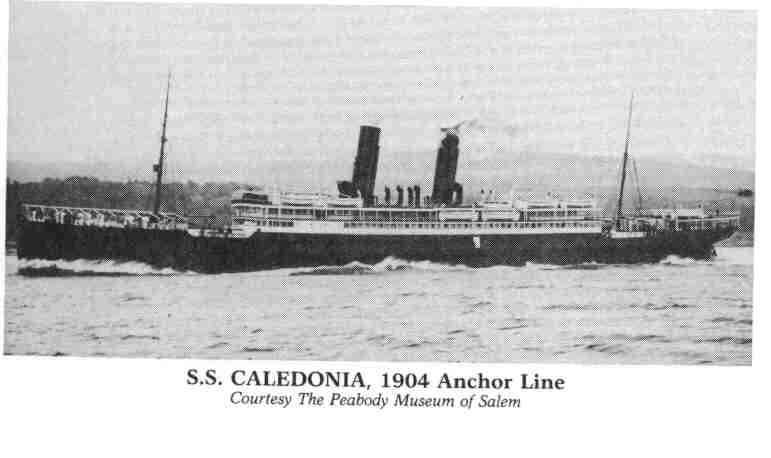 Figure 2: S.S. Caledonia prior to World War I, date and place unknown. Photograph courtesy of Old Ship Photo Galleries (http://www.photoship.co.uk). Click on photograph for larger image. 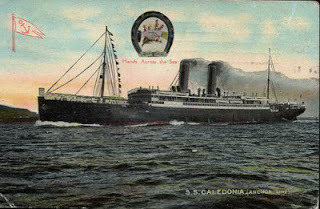 Figure 3: S.S. Caledonia prior to World War I, date and place unknown. Photograph courtesy of www.norwayheritage.com. Click on photograph for larger image. Figure 4: An Anchor Line postcard of S.S. Caledonia, probably prior to World War I, date unknown. Photograph courtesy of www.norwayheritage.com. Click on photograph for larger image. 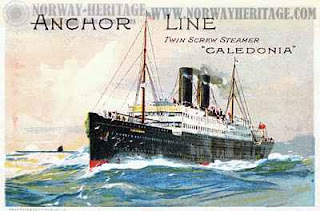 Figure 5: Another Anchor Line postcard of S.S. Caledonia. The date on the back of the card is 21 March 1914. This postcard was posted at the Pas de Calais, France, on 21 March 1914 by A. Elrick to Mrs. A McDougall, 59 Vernon Street, Maryhill, Glasgow, Scotland. The inscription on the card says, “Just a photo of the ship. We came here on Wednesday for England and weather permitting, will arrive on Sunday. I hope you got my letters. Ta ta. Yours sincerely, A Elrick.” Alexander McKenzie Elrick, the author of the postcard, was a gunner in the British Army attached to the Royal Garrison Artillery/111th Heavy Battery and was killed at the Somme, France, on 20 June 1918. Click on photograph for larger image. Figure 6: Anchor Line dinner menu from S.S. Caledonia on 4 July 1905, during a trip from Glasgow, Scotland, to New York City. Click on photograph for larger image. 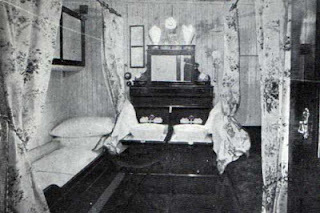 Figure 7: A stateroom on board Caledonia. Photograph taken from an Anchor Line travel brochure dated 1911. Click on photograph for larger image. Figure 8: First class dining saloon aboard Caledonia. Photograph taken from an Anchor Line travel brochure dated 1911. Click on photograph for larger image. 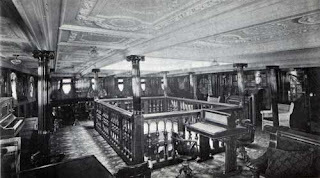 Figure 9: First class music saloon aboard Caledonia. Photograph taken from an Anchor Line travel brochure dated 1911. Click on photograph for larger image. Figure 10: Photograph of Caledonia dated 1904, possibly shortly after being launched, but it probably was actually taken in 1905 around the time of the ship’s maiden voyage on 25 March. Courtesy of the Peabody Museum, Salem, Massachusetts. Click on photograph for larger image. 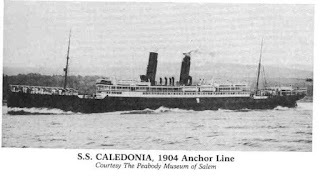 The 9,223-ton S.S. Caledonia was a British passenger ship built for the Anchor Line by David and William Henderson & Company at Glasgow, Scotland, and was launched on 22 October 1904. 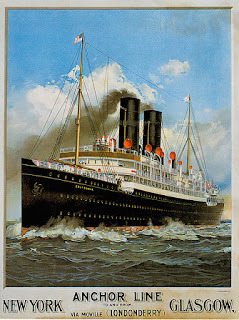 Caledonia went on her maiden voyage on 25 March 1905 and was used primarily for trips between Glasgow and New York City. The ocean liner was approximately 500 feet long and 58 feet wide and had a top speed of 16 knots. Caledonia could accommodate roughly 250 first class passengers, 350 second class passengers, and 850 third class passengers. 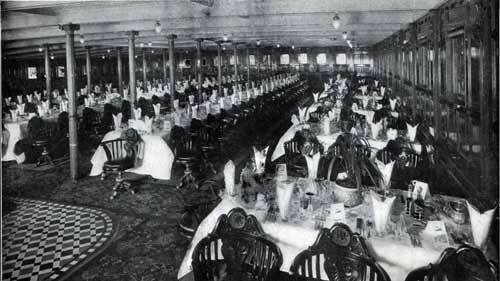 "First Cabin passengers are furnished with a liberal table, including all the delicacies of the season, and everything necessary on the voyage. Wines and liquors of finest quality can be had on board at moderate prices. The Dining Saloons, Music Hall, Ladies' Boudoir and Gents' Smoking Rooms are all located on the Upper and Promenade Decks, and, by means of electric bells, are in communication with the Steward's department. Every steamer carries a duly qualified Surgeon and experienced Stewardesses, and is provided with a select Library, including all the latest Guide Books of European travel. Staterooms are located on the Main and Upper Decks, are large, have electric lights, and are perfectly ventilated and elegantly furnished, accommodating two, three and four passengers each. All Staterooms are provided with electric bells connected with Steward's department." The rates for passage on board Caledonia ranged from $67.50 to $125, depending on the accommodations. Children between the ages of one and ten traveled for half fare. Infants under one year made the trip for only $5. When World War I began in August 1914, the British government requisitioned Caledonia and converted the elegant liner into a troop ship. After her conversion, Caledonia could carry 3,074 troops and 212 horses. For more than two years, the ship carried soldiers and their equipment to France and to various locations around the Mediterranean. 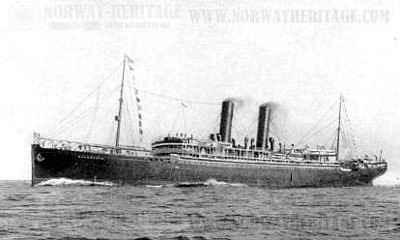 On 5 December 1916, while on a voyage carrying mail but no troops from Salonica, Greece, to Marseille, France, Caledonia was attacked by the German submarine U-65 under the command of Captain Hermann von Fischel. 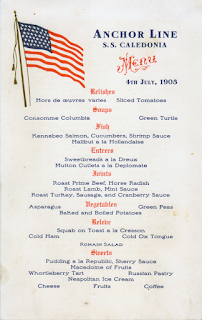 Caledonia was torpedoed without warning by U-65 approximately 125 miles east of Malta. Although his ship was sinking, Caledonia's commanding officer, Captain James Blaikie, steered the troop ship towards the U-boat and tried to ram her. Caledonia actually managed to hit the U-boat, causing severe damage to the submarine. But the U-boat stayed afloat as Caledonia sank, with the loss of only one life. Evidently, there was enough time for the rest of the crew to abandon ship and make it to the lifeboats before Caledonia went down. 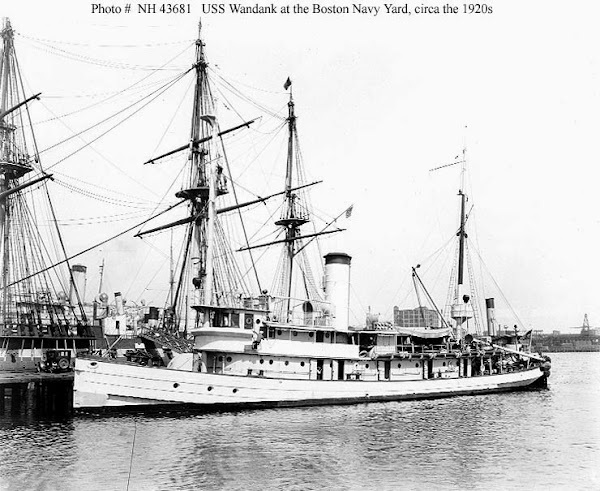 Fortunately, the absence of troops on board the ship helped keep the number of fatalities low. Had the ship been fully loaded with troops, the death toll would undoubtedly have been much higher. However, Captain Fischel of U-65 was so enraged by being rammed by Caledonia that he took Captain Blaikie prisoner from one of the lifeboats. For a time, Germany threatened to execute Captain Blaikie for trying to sink U-65. But the British government made it known to the German government (through the US ambassador at Berlin, since America was still neutral at that time) that a German officer prisoner-of-war would be shot if Captain Blaikie was executed. Evidently, the Germans backed down from their threat and Blaikie was sent for the rest of the war to an officers' prisoner-of-war camp at Friedberg, Germany.